In the early 14th century, churches began a long period of dominance as the world's tallest structures. Entrants from Estonia, France and Germany all vied for the title over the ensuing centuries. St. Olaf's in Tallinn succeeded Lincoln Cathedral in 1549, and held the designation until 1625, when its spire burned down after a lightning strike. 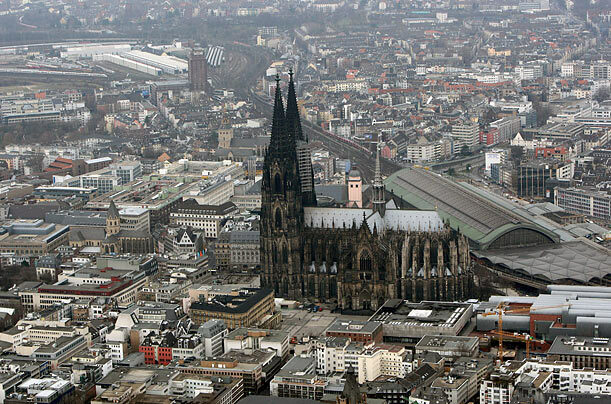 Houses of worship in Germany (Stralsund, Hamburg) and in Rouen and Strasbourg in France swapped the world's-tallest title until 1880, when Cologne Cathedral, which checked in at a towering 518 ft. (157 m), took over the honor after a laborious construction process that lasted more than six centuries. The German church, which survived bombing campaigns in World War II and became a World Heritage site in 1996, owned the designation for just four years, when the newly completed Washington Monument surpassed it.